The Dafne I refer to is not that of Jacopo Peri from 1598, and considered the first opera (for those who might want to make that kind of statement), but Marco da Gagliano’s 1608 setting, also using Ottavio Rinuccini’s libretto. 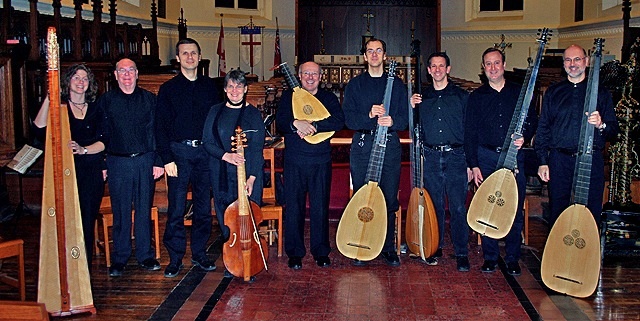 Dafne was brought to us through a happy co-production of Capella Intima (who specialize in baroque vocal music) and the Toronto Continuo Collective (who describe themselves as a 17th-Century “pluck band”). I heard this lovely opera for the first time at the Richard Bradshaw Amphitheatre, or in other words, as part of the Canadian Opera Company’s free noon-hour series. The nine instrumentalists mostly plucked (lute, harpsichord, archlute, theorbo, guitar) rather than sustained (a bowed bass viol and a little organ music near the end), which meant that the music tended to fade sweetly into the air, phrases dying sweetly, the way a stage picture lit by candles fades at the edges, and must always be an indistinct chiaroscuro. None of the six vocalists sang stridently, the voices sounding wonderfully apt for a royal court rather than a big public theatre. Everything was wonderfully intimate. Bud Roach is director of Capella Intima, while Lucas Harris & Borys Medicky are co-directors of Toronto Continuo Collective. But there was sense of collaborative team-work, partly because there was no conductor imposing upon the performance. While someone (I would guess it’s Harris or Medicky: I don’t know who) led the band especially at a few crucial moments, the singers and players stayed together by listening really well. This was a demonstration of pure musicianship. There was a genuine freedom to the performance, starting with the freshness of the material, an opera unknown to most in attendance, me included. It’s a valid way of telling a story, and a wonderful reminder of the original objectives for opera, that we read about in textbooks explaining “monody” and the Florentine Camerata. The words were clear, the voices without stress or strain, the exchanges between characters dignified. At times I was reminded of Lully and Rossi, who begin the declamatory style of the French opera at the end of the 17th century: except without all the dance. Tenor Roach was Apollo, first heard from offstage, in a mysterious game played with the rest of the cast. Luke Arnason, countertenor and Sheila Dietrich were Amore (or Cupid as he’s sometimes called) and his mother Venus. Their byplay was never dull and sometimes highly amusing as the saucy boy never let us forget who’s really boss. Emily Klassen was a wonderful Dafne, especially in the long period after her transformation, while Apollo mourns her change. Tenor John MacArthur (Tirsi) and baritone James Baldwin (Shepherd) complete an ensemble that had no weaknesses, that blended marvellously with the orchestra, and whose dramatic portrayals inhabited a middle ground something like “semi-staged”. I think one must be careful of such epithets unless one know both the objectives of the group and the proper way for such pieces to be staged. Perhaps this amount of drama is all that would have been given in 1608…? The last thing I want to do is misread or misjudge a performance by imposing modern expectations onto something quite splendid and beautiful. I only wish I could see & hear it again. This entry was posted in Music and musicology, Opera, Reviews and tagged Borys Medicky, Bud Roach, Capella Intima, Dafne, Jacopo Peri, Lucas Harris, Marco da Gagliano, Ottavio Rinuccini, Toronto Continuo Collective. Bookmark the permalink. Thanks for the review. I was really annoyed to miss this one. Last minute work emergency. Speaking as someone who was AWOL for much of the past month, you’re welcome, and I’m glad to read your reviews that keep me (and others) up to date. I wondered about this one, good that you managed to catch it. I keep missing their concerts, chiefly because they have no social media presence. Just spent ten minutes looking for Capella Intima, Toronto Continuo Collective and Bud Roach on Facebook and Twitter, to no avail. This is important feedback (thank you).